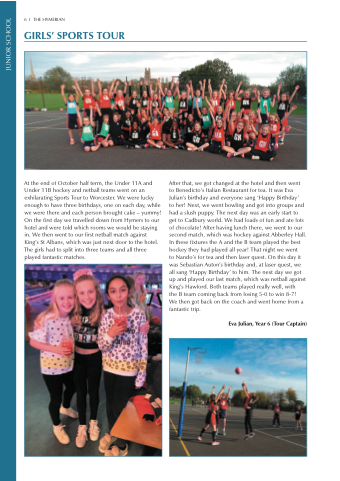 At the end of October half term, the Under 11A and Under 11B hockey and netball teams went on an exhilarating Sports Tour to Worcester. We were lucky enough to have three birthdays, one on each day, while we were there and each person brought cake – yummy! On the first day we travelled down from Hymers to our hotel and were told which rooms we would be staying in. We then went to our first netball match against King’s St Albans, which was just next door to the hotel. The girls had to split into three teams and all three played fantastic matches. the B team coming back from losing 5-0 to win 8-7! We then got back on the coach and went home from a fantastic trip.